Although Valentines Day has already passed, we haven't yet felt the love the InterNations way...So be ready to show your love dressed in red or black at the next InterNations Official Event. There will be a surprise winner announced tonight . The gift has been sponsored with the courtesy of Ocean Spa. They are located at the same premises and are known for their relaxing massages and hair cuts.. 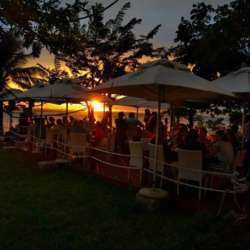 Looking forward to see you all at this beautiful evening at the Bar In Dar at the Slipway listening to the waves and watching the stars. The Bar in Dar is a tapas bar with simply amazing cocktails! Although the event starts at 20:00pm, if you want to reach the event before the sunset and catch the live music then feel free to do so! Remember the registration closes at 17:00pm on February 21.